From North Georgia to Southern Mississippi, Western Kentucky and Western Oregon, Tennessee Tech to Prairie View A&M, 53 teams from across the country and the continent (welcome Autónoma de Nuevo León from Mexico) have converged on Pensacola, Florida for the 2017 edition of the NIRSA Flag Football Championships. Teams from schools large and small will do battle alongside perennial favorites — Valdosta State, Angelo State, and UCF — as they seek the national title. Three days, over 100 games in all, ending with 3 national championship contests on Sunday at Escambia County Stadium near the tournament’s host institution, the University of West Florida. 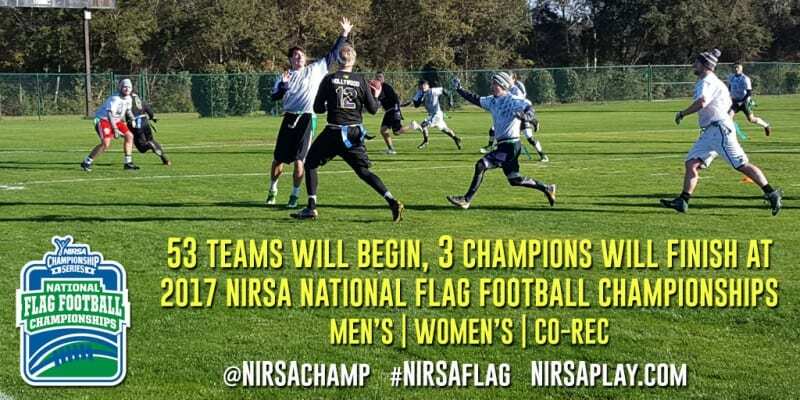 We’ll have coverage for you here on nirsaplay.com but follow us on Twitter and Instagram, @NIRSAchamp, for score reports and highlights throughout each day of tournament action. Then, watch the championship games live online with our webcasts Sunday starting at 10:30 am Central Time. The action kicks off Friday morning here in sunny Pensacola with pool play. Single-elimination tournament action starts Saturday leading to Sunday’s finals. The women’s national title game is at 10:30 am CT, then co-rec at 12 Noon CT, and men’s at 1:30 pm CT. 3 champions from 53 teams over the course of 3 days. It’s the 2017 NIRSA National Flag Football Championships.